Received October 17, 2018; Revised November 5, 2018; Accepted November 5, 2018. Plant tissue culture is a technique that has invariably been used for various purposes such as obtaining transgenic plants for crop improvement or functional analysis of genes. However, this process can be associated with a variety of genetic and epigenetic instabilities in regenerated plants, termed as somaclonal variation. In this study, we investigated mutation spectrum, chromosomal distributions of nucleotide substitution types of single-nucleotide polymorphisms (SNPs) and insertions/deletions (InDels) by whole genome re-sequencing between Dongjin and Nipponbare along with regenerated plants of Dongjin from different induction periods. Results indicated that molecular spectrum of mutations in regenerated rice against Dongjin genome ranged from 9.14 × 10−5 to 1.37 × 10−4 during one- to three-month callus inductions, while natural mutation rate between Dongjin and Nipponbare genomes was 6.97 × 10−4. Non-random chromosome distribution of SNP and InDel was observed in both regenerants and Dongjin genomes, with the highest densities on chromosome 11. The transition to transversion ratio was 2.25 in common SNPs of regenerants against Dongjin genome with the highest C/T transition frequency, which was similar to that of Dongjin against Nipponbare genome. Agrobacterium-mediated gene transformation based on tissue culture system is a relatively high efficiency method, most commonly used for transgenic plant development. This often involves introduction of foreign gene into callus or other explants, accompanied by cell selection and plant regenerations. However, this process can be associated with a variety of genetic and epigenetic instabilities in regenerated plants (Kaeppler et al. 2000; Leva et al. 2012). In terms of transgenic plants, unintended genetic and epigenetic changes caused by somaclonal variation or foreign gene insertion or coupled effects might well repay investigations. In recent years, advances in construction of high-quality map-based reference genomes for model plants and next-generation sequencing (NGS) technologies have enabled more efficient identification of genome-wide DNA polymorphisms such as single nucleotide polymorphisms (SNPs) and insertion/deletions (InDels). So far, several studies have been carried out to reveal mutation rate and mutation spectrum of somaclonal variation in regenerated rice plants (Miyao et al. 2012; Kawakatsu et al. 2013; Zhang et al. 2014; Kashima et al. 2015). Generally speaking, transgenic rice productions require about 2.5 to 3 months accompanied with four steps consisting of callus induction, Agrobacterium co-cultivation and selection, shoot differentiation and plant regeneration. Long time in vitro culture and random transgene insertion provide possibilities on occurrences of unintended genetic changes (Phillips et al. 1994). Therefore, to distinguish transgene insertional mutations and somaclonal variations induced by tissue culture would be very necessary in confronting debates on biosafety of transgenic crops. Recently, DNA polymorphisms of transformants or regenerants derived from several treatments such as variable Agrobacterium strain, T-DNA transformation approach, and selection condition had been studied by Wei et al. (2016). They found that regenerants and transformants showed relatively low mutation rates comparing to those of T-DNA tagged mutants and Tos17 lines under different treatments collectively. And also, they could not conclusively differentiate SNPs and InDels caused from Agrobacterium transformation and callus-induced somaclonal variation. Thus, unintended genomic changes may be interpreted to exist in the germplasm or as other type of induced mutagenesis. Rice as one of the important staple foods for world’s populations is often used for gene functional study and transgenic rice development (Wang et al. 2013). For transgenic crops/plants developed by Agrobacterium-mediated transformation, people tend to be concerned with food, feed and environmental biosafety, which possibly triggered by genetic variations including somaclonal variations and transgene insertion mutations. 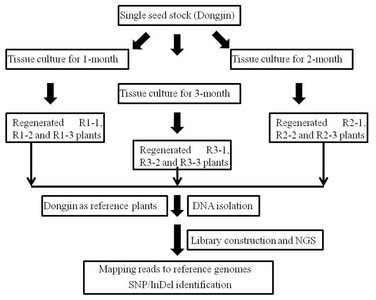 In the present study, a conventional Korean rice variety ‘Dongjin’ was used for one-month, two-month, and three-month callus inductions, respectively. These calli experienced generation substitutions by subcultures of 3, 6 and 9 times respectively, followed by plantlets regeneration. By using whole genome re-sequencing technique, we attempted to assess mutation spectrum and patterns of somaclonal variation in rice regenerants derived from different callus induction periods of a non-transgenic rice variety Dongjin. We believed that chromosomal and DNA mutation levels on regenerated rice plants would be valuable references to biosafety assessment of transgenic rice and other plants. A commercial Korean japonica rice cultivar ‘Dongjin’ (Oryza sativa ssp.) and its regenerated plants from 1-month, 2-month, and 3-month callus inductions, respectively, were used for this study. After sterilization of mature dehulled Dongjin seeds, callus was induced on Murashige and Skoog (MS) solid medium with 2 mg/L 2,4-dichlorophenoxyacetic acid (2,4-D) at 26 ± 1°C in darkness. Calli subculture was performed every 10–12 days as one generation. The fresh calli were selected and transferred onto new callus induction medium (MS). After callus induced, MS medium with 1.0 mg/L kinetin and 0.1 mg/L naphthalene acetic acid (NAA) were used for shoot regeneration under the conditions with 16-hour photoperiod and 26 ± 1°C of room temperature. Root formation of shoot regenerants was performed on plant growth regulator-free basal MS medium for 2 weeks, followed by culture in 0.1% Hyponex solution (Hyponex, Imlay, MI, USA) for 1 week. All of regenerated plantlets were subsequently transplanted into the soil in pots and grown in a greenhouse. Actually, 1-month, 2-month, and 3-month callus inductions were separately experienced 3, 6 and 9 calli generations. The regenerated plantlets were named as R1, R2, and R3 groups, respectively (Fig. 1). Three plants from each regenerated plant group and three Dongjin plants were leaf sampled during seedling stages and stored at −80°C, until DNA extractions. CTAB method was used for genomic DNA isolation, with an additional step of chloroform purification. After RNase treatment, DNA concentrations were quantified by Nanodrop ND 1000-spectrophotometer (Thermo Fisher Scientific Inc., Wilmington, NC, USA) and storage at −20°C. Approximately 20 μg each of high-quality genomic DNA from 12 plant samples was prepared for NGS. The fragmented genomic DNA was blunt end-repaired, adenylated, ligated with paired-end adaptors, and enriched/linearized with PCR to construct library using TruSeq DNA Nano sample preparation kit, according to the manufacturer’s protocol (Illumina, San Diego CA, USA). Agilent 2100 Bioanalyzer DNA chip and Qubit® 2.0 Fluorometer (Invitrogen) were used for quality control of libraries and concentration analysis. Then, each sample was sequenced on an individual lane on a NextSeq® 500 (Illumina Inc., San Diego, CA, USA) sequencing system. Before whole genome re-sequencing analysis, raw data was processed for adaptor trimming and low-quality reads filtering by quality score > Q30 (QPhred = 30). Trimmed sequencing reads created from three Dongjin plants and nine regenerated plantlets were separately mapped against the standard japonica rice genotype Nipponbare reference genome (the Os-Nipponbare-Reference-IRGSP-1.0, http://rapdb.dna.affrc.go.jp/download/irgsp1.html) using Burrows Wheeler Aligner (BWA) software algorithm. SNP and InDel identifications between Nipponbare and Dongjin, and/or nine regenerated rice plants were further analyzed using SAMtools (v0.1.17) software following descriptions by Arai-Kichise et al. (2014). The Illumina sequencing collectively yielded 26,093 × 106 bps and 69,111 × 106 bps for three Dongjin genomes and nine regenerated plant genomes, respectively. After filtering, the high-quality data with an average 92.28% of total reads were used to analyze genetic variations for all samples. By mapping against the standard Nipponbare reference genome, on average of 91.88% of Dongjin and 90.62% of regenerated plants of sequencing reads were uniquely mapped onto Nipponbare reference genome, covering 96.36% and 95.96% of the Nipponbare genome, respectively. Moreover, effective sequencing depths of mapped reads were 20.42 × and 17.70 × across the whole genomes of Dongjin and its regenerated plants, respectively. Among chromosomes, chromosome 11 had the lowest genome mapping depths of 18.05 × for Dongjin and 15.63 × for regenerated plants, while the highest mapping depth of 21.11 × and 19.17 × were detected in chromosome 12 of Dongjin and chromosome 10 of regenerated plants, respectively. SNPs and InDels were identified from Dongjin genomes against Nipponbare. A total of 242,530 SNPs, 5,968 insertions and 6,609 deletions were identified. The average natural mutation rate including SNPs and InDels per site between Dongjin and Nipponbare genome was 6.97 × 10−4, with 373.245 Mb being the size of the reference genome Nipponbare. The highest and lowest densities of variants were located on chromosome 11 and chromosome 3. Both SNPs and InDels showed the highest densities on chromosome 11 (Fig. 2A and B). In addition, high relative densities of SNPs were detected on chromosome 10, 12, and 8, while chromosome 4 and 10 were identified for high densities of InDels. On chromosome 4, 8 and 11, slight differences in SNP densities were observed in three Dongjin genomes (DJ1, DJ2, and DJ3). InDel distributions on most of chromosomes were found to be close to the centromeres. A large proportion (> 75%) of total InDels occurred within a small scale (≤ 2 bp), with maximum insertions/deletions scale of 24/31 bp (Fig. 3A). Nine Dongjin regenerated plants from three groups R1, R2 and R3 were separately sequenced and analyzed for variants profiles depending on the callus induction periods (one to three months) against Dongjin genome. The regenerated plant groups were observed to have the highest SNP and InDel densities on chromosome 11, followed chromosome 8 and 10. On the contrary, chromosome 9 and 5 were observed to have the lowest SNP and InDel frequencies, respectively (Fig. 2C and D). InDels (146 insertions and 141 deletions) occurring within a small scale (≤ 2 bp) accounted for a large proportion (approximately 78%) of total InDels, with maximum insertions/deletions scales of 13/14 bp (Fig. 3B). On the basis of varying distribution frequencies on the chromosomes, SNPs and InDels from regenerated plants shared similar mutation patterns with that of natural variations between two rice varieties. This phenomenon implied that SNP and InDel occurrences caused by callus induction are prone to occur in the preferred regions of natural variations between varieties. We identified a total of 33,005 SNPs and 1,104 InDels from R1 group, 40,806 SNPs and 2,049 InDels from R2, and 48,889 SNPs and 2,382 InDels from R3, compared to Dongjin genome. Line specific SNPs were detected for 15,896 of R1, 17,077 of R2, and 23,874 of R3 groups, constituting 48.16%, 41.85% and 48.83% of the total SNPs, respectively. Similarly, line specific InDels were detected for 429 of R1, 949 of R2 and 1,154 of R3 groups, constituting 38.86%, 46.32% and 48.45% of the total InDels, respectively (Fig. 4). DNA mutations were commonly detected for 5,366 SNPs and 130 InDels between R1 and R2 groups, 6,652 SNPs and 258 InDels between R1 and R3 groups, and 13,272 SNPs and 683 InDels between R2 and R3 groups. Approximately 5,091 SNPs and 287 InDels were commonly detected in the three groups. The average mutation rate including SNPs and InDels successively increased from 9.14 × 10−5 in R1 group to 1.37 × 10−4 in R3 group. Base substitution patterns of identified SNPs were categorized and analyzed to an average value of 2.20 on the ratio of transitions (A/G or C/T) to transversions (A/C, T/A, G/T or C/G) in Dongjin compared to Nipponbare genome (Fig. 5A). Numbers of transitions A to G and C to T were calculated as 72,202 and 94,653, but transversion of A to C, T to A, G to T and C to G were calculated as 16,714, 23,831, 20,945 and 14,185, respectively. Analysis of base substitution patterns suggested that changes from C to T occurred more frequently, followed by A to G and T to A. Base substitution patterns of SNPs identified from three regenerated plant groups were calculated as ratio of transitions to transversions (Ts/Tv) that ranged from 1.90 for chromosome 10 to 2.90 for chromosome 9, with an average of 2.25. C/T transition was the most frequent base substitution. Transition of A to G and transversion of T to A were also shown with high relative frequencies, compared to other base substitutions (Fig. 5B). This Ts/Tv ratio and base substitution profiles on regenerated plant groups seemed much closer to those of Dongjin genome. In the present study, we investigated chromosomal distributions, mutation rates and base substitutions of SNPs and InDels not only between two japonica rice varieties Dongjin and Nipponbare bred by conventional breeding methods, but also between regenerated plants induced by rice callus culture and their donor variety Dongjin. Compared to Nipponbare genome, the highest chromosomal distribution densities of SNPs were observed on chromosomes 11 of Dongjin, followed by chromosome 10, 12 and 8, however, the highest InDel densities were detected on chromosome 11 followed by chromosome 4 and 10 respectively. In regenerants, the highest densities of both SNP and InDel were detected on chromosome 11, followed by chromosome 8 and 10, against Dongjin genome. The most frequent base substitution was C/T transition in both Dongjin and regenerant genomes. Similarly, Ts/Tv ratios were calculated to be 2.20 for Dongjin and 2.25 for regenerants. Thus, it can be seen that both natural variations (SNPs and InDels) between varieties and somaclonal variations in regenerants preferred chromosome 11, followed by chromosome 8, and 10. For regenerated plant genomes, 5,378 of SNPs and InDels were common detected from three regenerated plant groups. We believed these somaclonal variations were induced by callus culture, regardless of the callus induction periods. Meanwhile, these variants were found to share similar chromosomal distribution and base substitution patterns with those of natural variations. Except for common variants, both line specific SNPs and InDels were observed to increase substantially for each month of extension in callus induction period. Compared to R2 group, significant increase of line specific SNPs and InDels were observed in R3 group, which indicated more than two-month tissue culture might cause significant increases of genetic variations in regenerants. However, the mutation rate of 1.37 × 10−4 for three-month callus induced regenerants was still much lower than natural mutation rate of 6.97 × 10−4 between two Dongjin and Nipponbare cultivars. The mutation rates of somaclonal variation in this study are similar to those of five-month callus induced rice regenerants with an average mutation rate of 5.0 × 10−5 reported by Zhang et al. (2014), but approximately 50- to 200-folds higher than rice regenerants derived from Koshihikari and Nipponbare rice varieties in other studies (1.74 × 10−6 reported by Miyao et al. (2012); 5.5 × 10−7 reported by Kawakatsu et al. (2013); 1.41 × 10−6 reported by Kashima et al. (2015)). The reasons for this discrepancy might be differences in genetic background of donor varieties. In conclusion, prolonged callus induced periods could increase in mutation spectrum, which was far below natural mutation rate. Genomic variations induced by tissue culture and natural mutations between cultivars were found to have similar patterns of chromosome distribution and nucleotide substitution. Through this study, we provided approximate ranges for mutation spectrums, chromosome distributions, and nucleotide substitutions of SNPs and InDels for one-, two- and three-month callus induced rice regenerants. We believed these results would be valuable references for development of transgenic plants by using in vitro cell culture and Agrobacterium-mediated transformation techniques. Furthermore, it provides new perspective on risk assessment of transgenic plant. As a reference, several transgenic lines derived from donor variety Dongjin will be used to analyze genomic variations in the further study. This work was supported by a grant (PJ01194401) from the National Academy of Agricultural Science (Rural Development Administration, Republic of Korea). Fig. 1. Schematic diagram showing preparation of regenerated plants for Next-generation sequencing (NGS). Fig. 2. Chromosomal distributions of single nucleotide polymorphisms (SNPs) and Insertion/Deletions (InDels) per 1 Mb in Dongjin and regenerant genomes respectively. (A) and (B), SNP and InDel distributions in Dongjin genome against Nipponbare, (C) and (D), SNP and InDel distributions in regenerant genomes against Dongjin. Fig. 3. 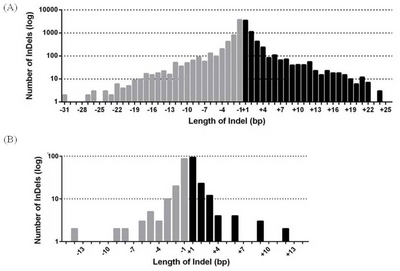 Distributions of the length of Insertion/Deletions (InDels) for Dongjin genome (A) and regenerated plant groups (B). The x-axis shows the number of nucleotide insertions (black) and deletions (gray), y-axis shows the number of InDels at each length. Fig. 4. Venn diagram showing single nucleotide polymorphisms (A) and Insertion/Deletions (B) identified from R1, R2 and R3 regenerant plant groups against Dongjin genome. The overlapped parts indicate common detections in R1 and R2, R1 and R3, R2 and R3, and R1, R2 and R3. Fig. 5. 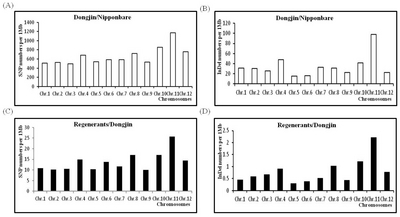 Base substitution patterns and frequencies between Dongjin and Nipponbare (A), and Dongjin and its regenerated plants (B). Anderson, JE, Michno, JM, Kono, TJY, Stec, AO, Campbell, BW, and Curtin, SJ (2016). 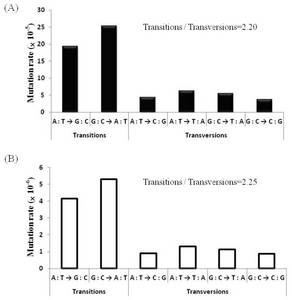 Genomic variation and DNA repair associated with soybean transgenesis: a comparison to cultivars and mutagenized plants. BMC Biotechnol. 16, 41. Arai-Kichise, Y, Shiwa, Y, Ebana, K, Shibata-Hatta, M, Yoshikawa, H, and Yano, M (2014). Genome-wide DNA polymorphisms in seven rice cultivars of temperate and tropical Japonica groups. PLoS ONE. 9, e86312. Husaini, AM, Abdin, MZ, Parray, GA, Sanghera, GS, Murtaza, I, and Alam, T (2010). Vehicles and ways for efficient nuclear transformation in plants. GM Crops. 1, 276-287. Jeong, IS, Yoon, UH, Lee, GS, Ji, HS, Lee, HJ, and Han, CD (2013). SNP-based analysis of genetic diversity in anther derived rice by whole genome sequencing. Rice. 6, 6. Jiang, C, Mithani, A, Gan, X, Belfield, EJ, Klingler, JP, and Zhu, JK (2011). Regenerant Arabidopsis lineages display a distinct genome-wide spectrum of mutations conferring variant phenotypes. Curr Biol. 21, 1385-1390. Kaeppler, SM, Kaeppler, HF, and Rhee, Y (2000). Epigenetic aspects of somaclonal variation in plants. Plant Mol Biol. 43, 179-188. Kashima, K, Mejima, M, Kurokawa, S, Kuroda, M, Kiyono, H, and Yuki, Y (2015). Comparative whole-genome analyses of selection marker-free rice-based cholera toxin B-subunit vaccine lines and wild-type lines. BMC Genomics. 16, 48. Kawakatsu, T, Kawahara, Y, Itoh, T, and Takaiwa, F (2013). A whole-genome analysis of a transgenic rice seed-based edible vaccine against cedar pollen allergy. DNA Res. 20, 623-631. Miyao, A, Nakagome, M, Ohnuma, T, Yamagata, H, Kanamori, H, and Katayose, Y (2012). Molecular spectrum of somaclonal variation in regenerated rice revealed by whole-genome sequencing. Plant Cell Physiol. 53, 256-264. Ossowski, S, Schneeberger, K, Lucas-Lledó, JI, Warthmann, N, Clark, RM, and Shaw, RG (2010). The rate and molecular spectrum of spontaneous mutations in Arabidopsis thaliana. Science. 327, 92-94. Phillips, RL, Kaepplert, SM, and Olhoft, P (1994). Genetic instability of plant tissue cultures: Breakdown of normal controls. Proc Natl Acad Sci USA. 91, 5222-5226. Sabot, F, Picault, N, El-Baidouri, M, Llauro, C, Chaparro, C, and Piegu, B (2011). Transpositional landscape of the rice genome revealed by paired-end mapping of high-throughput re-sequencing data. Plant J. 66, 241-246. Schouten, HJ, Geest, HV, Papadimitriou, S, Bemer, M, Schaart, JG, and Smulders, MJM (2017). Re-sequencing transgenic plants revealed rearrangements at T-DNA inserts, and integration of a short T-DNA fragment, but no increase of small mutations elsewhere. Plant Cell Rep. 36, 493-504. Sharma, N, Singh, SK, and Lal, S (2016). Transgenic research in fruit crops: current status. Adv Genet Eng. 5, 1-4. Wang, N, Long, T, Yao, W, Xiong, LZ, Zhang, Q, and Wu, C (2013). Mutant resources for the functional analysis of the rice genome. Mol Plant. 6, 596-604. Wei, FJ, Kuang, LY, Oung, HM, Cheng, SY, Wu, HP, and Huang, LT (2016). Somaclonal variation does not preclude the use of rice transformants for genetic screening. Plant J. 85, 648-659. Yamamoto, T, Nagasaki, H, Yonemaru, JI, Ebana, K, Nakajima, M, and Shibaya, T (2010). Fine definition of the pedigree haplotypes of closely related rice cultivars by means of genome-wide discovery of single-nucleotide polymorphisms. BMC Genomics. 11, 267. Zhang, D, Wang, Z, Wang, N, Gao, Y, Liu, Y, and Wu, Y (2014). Tissue culture-induced heritable genomic variation in rice, and their phenotypic implications. PLoS ONE. 9, e96879.